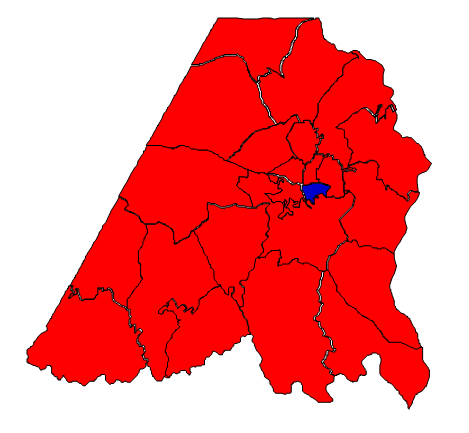 Stanly County is located in south-central North Carolina; the county seat is Albemarle. The county was named for John Stanly of New Bern, who served in the U.S. House of Representatives. Prognosis: Stanly has been solidly Republican since the 1980s, and has grown even more Republican since then. Republicans have a 10-point edge in terms of voter registration, and whites compose 86% of the electorate, making any Democratic victory here almost impossible. The growth rate in the 2000s was a weak 4.28%, and the demographics have changed only marginally. Even if Democrats start to do better with working-class whites, Stanly is certain to be a blowout for Republicans. In 2012, Mitt Romney swept the county, carrying all but one precinct. Trivia: Former American Idol contestant Kellie Pickler is from Albemarle.